Psalm 1, the Christ Junkie, as part of his 10 years in ministry celebrations is set to have his annual Vimming Concert this year starting with one in the only Garden City of Kumasi, KNUST to be precise in the month of March. It is necessary to know that, Psalm 1, the Christ Junkie started his event organising journey 5 years ago when he was still a student in KNUST with the event, "Psalm 1 and Friends". This event gave birth to Vimming Concert two years later after 2 editions held in Kumasi. 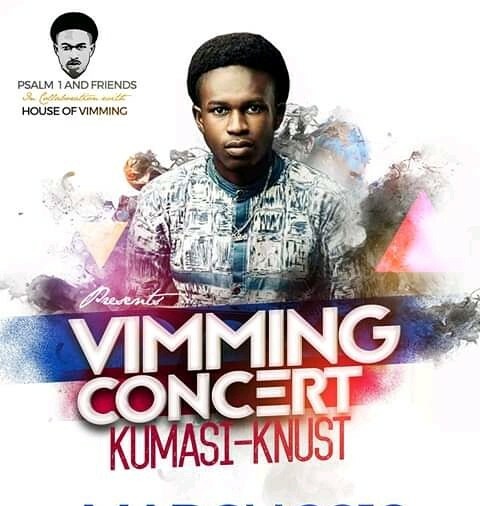 In 2018, Psalm 1 and House of Vimming returned to Kumasi after 3 years to have the first Vimming Concert kumasi which featured Majid Michel, Timothy Benton, Pascal Amanfo, George Peprah and many other talents unearthed in Kumasi which was a great success.